THE BIERGARTEN IS NOW OPEN! Early renewals and new member renewals for the 2018-2019 membership year have begun! If you have a friend or family member that’s been holding off on signing up for a membership, next week is the time to do it! New members will receive over 13 months of membership for only $10! Stop in, visit Leann, and enjoy one of our many variations of the classic American hamburger or hot dog! Now featuring Brats and soup as well! As always, we feature $1 Yuengling pints all day! A native of Monterey, California, Taylor emigrated to Nashville a couple of years ago with the intention of creating opportunity. In short form, he became a working sideman with positions as a guitarist for Tanya Tucker, Kristen Kelly, and Josh Dorr. He plays a wide variety of originals and covers. The Maennerchor is hosting this long-running National event for the second year. 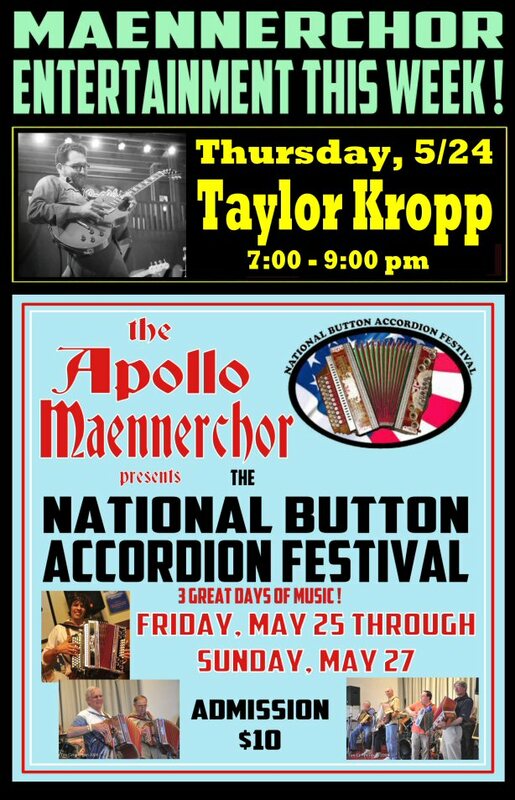 Over a 3-day period, hundreds of guests from out of town are expected, some from as far away as Alaska, to participate in what may be the world’s largest accordion open-mic event. There will be examples of accordion music spanning every genre and ethnicity, from Polka to Zydeco. The Club was granted special permission from the PLCB to act as a public venue for this 3-day period, so members and non-members alike are welcome to attend! ADMISSION IS $8 ON FRIDAY, $10 ON SATURDAY OR SUNDAY, OR $25 FOR A 3-DAY PASS. Music will be performed simultaneously in the Festhalle, in the bar room, and outdoors if the weather cooperates. FRIDAY – Doors open at 4:00 pm, music commences from 5:00 until 10:00 pm with the “get acquainted party” with dancing and accordion jamming. SATURDAY – Doors open at 11:00 am, music commences from 12:00 noon until 10:00 pm with all day dancing and jamming. SUNDAY – Doors open at 11:00 am, Formal concert begins at 12:30 pm, including a tribute to Veterans until 2:30, followed by the “grand jam” with dancing until 9:00 pm. On Sunday ethnic attire is encouraged. Friday night through Sunday a buffet will be offered. PARKING – We will have overflow parking available in lots adjacent to the Club. These areas will be marked. They include the lot immediately north of the outdoor biergarten (the former Bonner Home Supply/Johnson-Sizer Co. property), the lot across Dock St. to the north (the former Kopen Beverage Co.), the lot directly across Dock St. from the Club (Bob’s Auto) which includes ample parking underneath the Rt. 62 overpass. We estimate that these lots combined can easily accommodate over 200 vehicles. We’re encouraging our members to use the overflow parking areas as a courtesy to our out of state guests who will be spending a weekend in our valley.